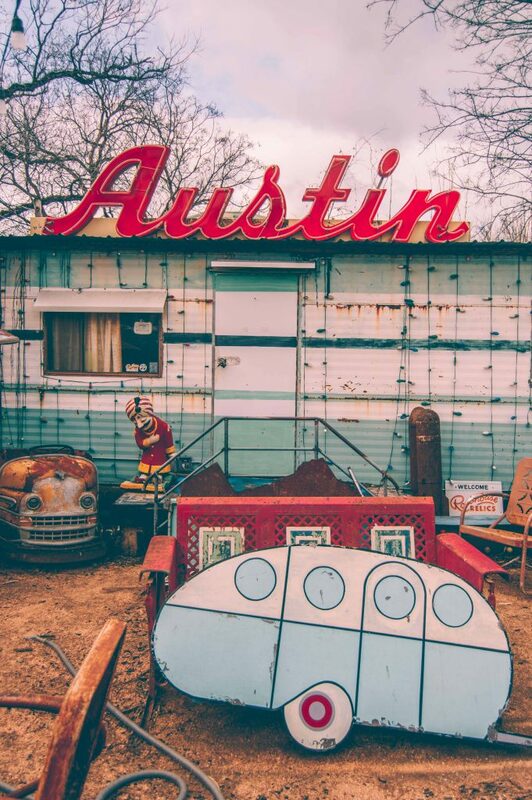 It’s not impossible that by the end of writing this guide for a weekend in Austin I’ll be crying tears of nostalgia, but I am going to write it all the same. You see, Austin used to be my home for two glorious years until I had to move all the way to Sri Lanka and then to Germany during Oktoberfest no less. But for two years I was proud to call the capital of Texas my home. 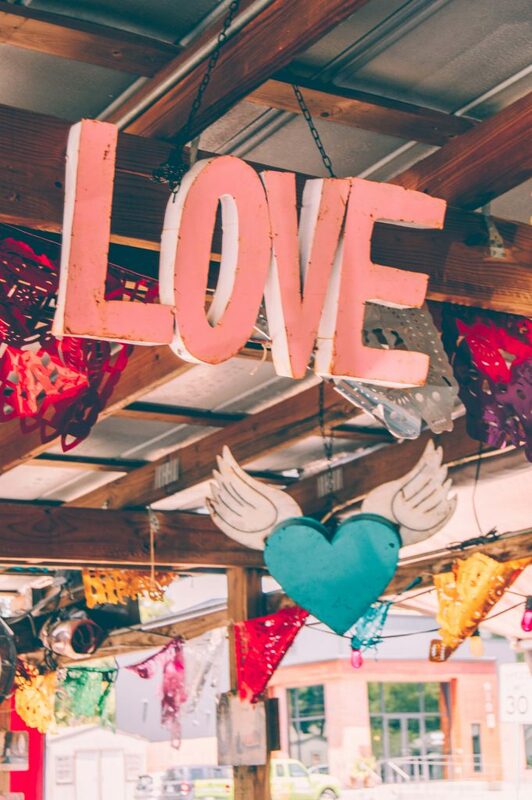 My to-do and, especially, to-eat in Austin lists still have a lot of unchecked items, but I did eat my fair share of breakfast tacos and visited a bunch of places that “keep Austin weird”. 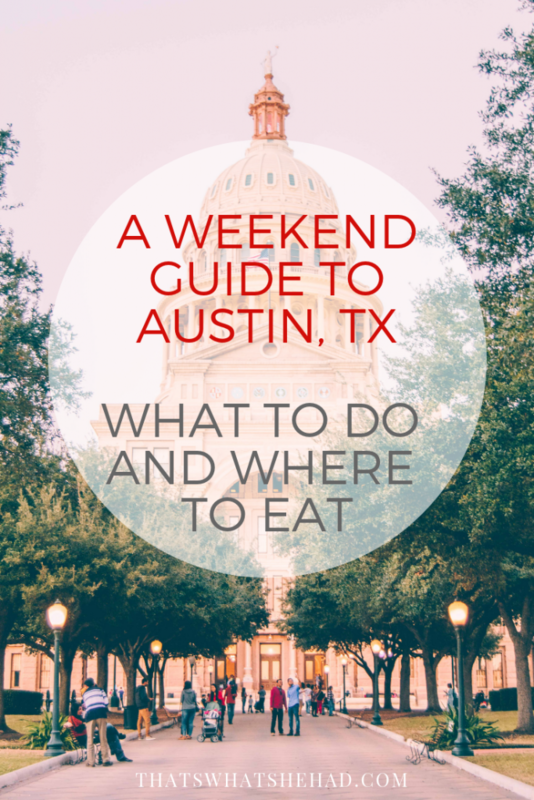 I think this important knowledge shouldn’t go to waste, so here’s a guide to a perfect weekend in Austin from a former, short-term, somewhat Austin local. These are my favorite things to do, places to eat and little hidden gems of the city that I’d revisit again in a heartbeat. 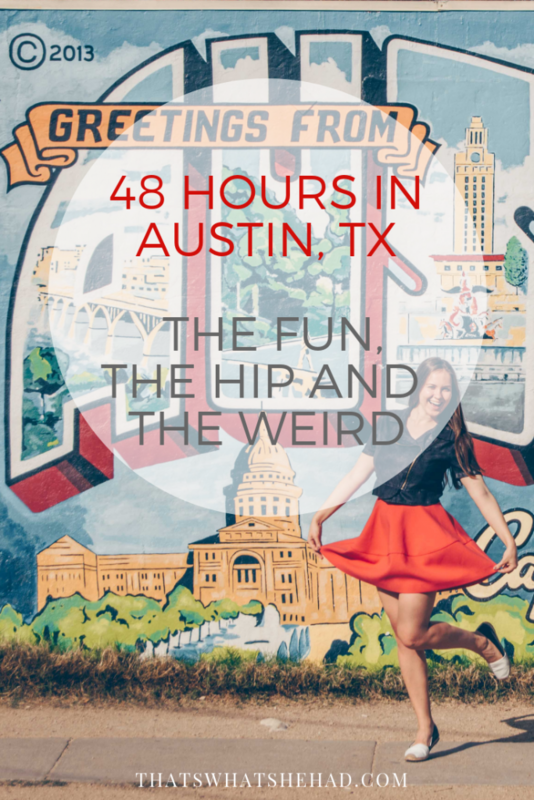 I hope you enjoy your 36 hours in Austin, TX! Tip: Austin is quite spread out so you’ll need a car to get around. 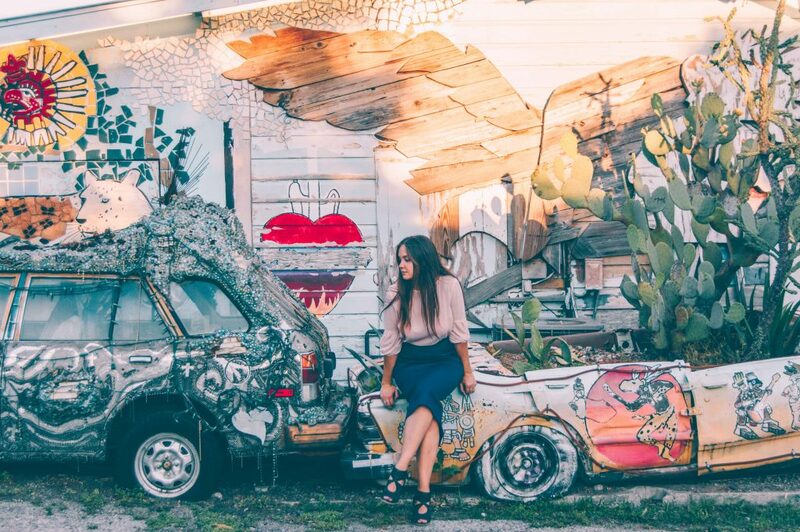 Finding strange spots like this was my favorite pastime in Austin. Outside South Austin Museum of Popular Culture. Damn good tacos at Torchy’s! You know what their slogan sounds like? 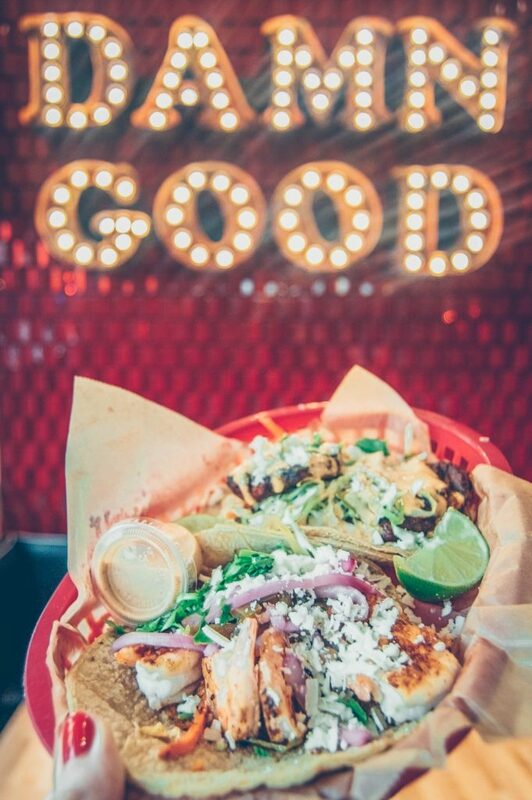 “Damn good tacos!” And they are not lying. 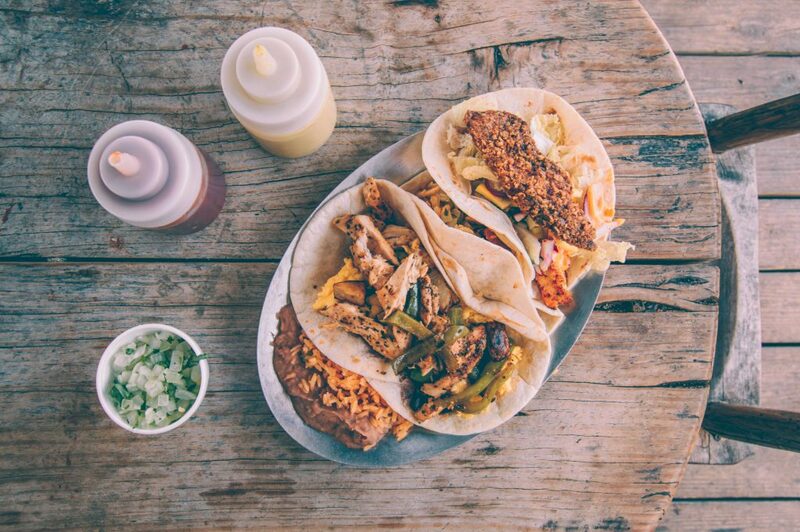 Torchy’s to Austin is what Shake Shack is to NYC and In and Out — to Los Angeles. If you’ve never been to Austin before, you might be wondering why I am sending you to a taco joint at nine in the morning. That’s because you have to try breakfast tacos or else your trip to the capital of Texas doesn’t count. Torchy’s started out as a food truck and grew into a small taco empire with multiple locations in Austin and around Texas. Their tacos are still as good, though, and any local will recommend it for your first weekend in Austin. By the way, Torchy’s has a secret menu. So if you are not scared to come up to a cashier and ask for a Mad Cow or The Hipster, you are in for a treat! Torchy’s Tacos — they have multiple locations around Austin, but for the purposes of this guide, head to the one at 1822 South Congress Avenue. From Torchy’s Tacos head down South Congress Avenue towards city center. 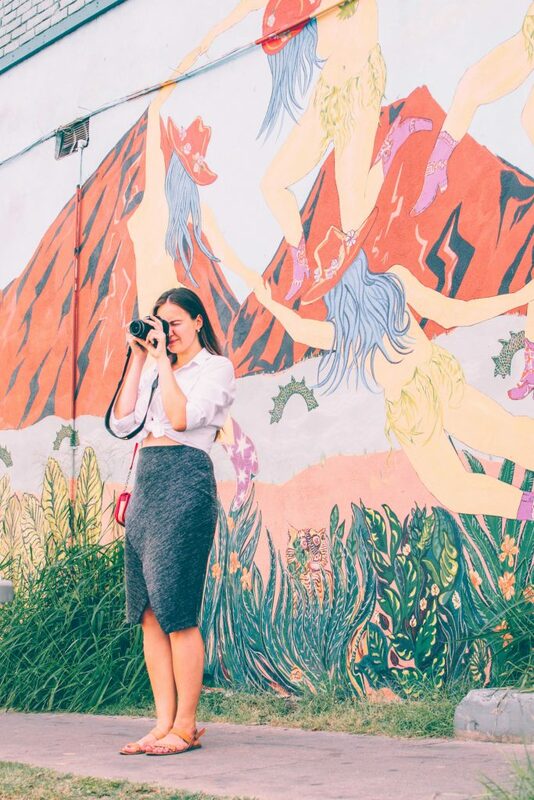 SoCo, as locals call it, is a stretch of South Congress Avenue that features dozens of boutique shops, restaurants and bars. On weekends it gets especially crowded with lines outside Hopdoddy Burger and Home Slice Pizza. 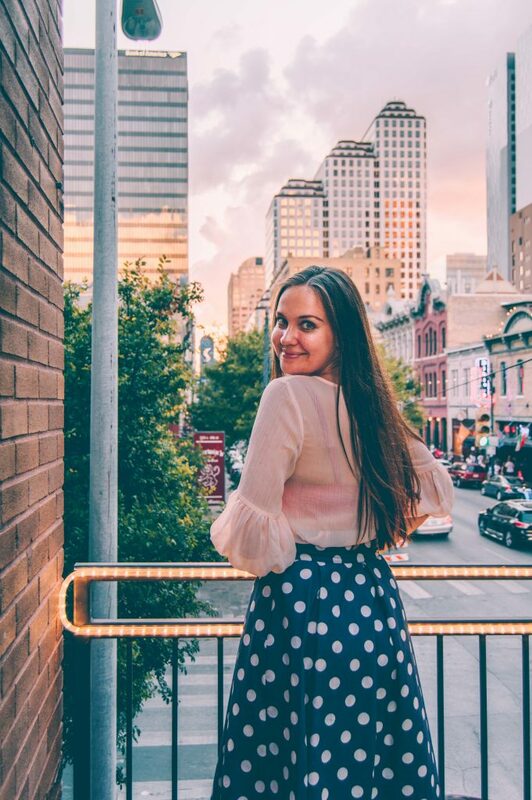 Take your time exploring one of Austin’s most popular neighborhoods and doing some spontaneous shopping: you’ve come to the capital of Texas, you definitely need those cowboy boots, right? If you are in search of a good cup of coffee on South Congress, Toms is a good option. See what a happy cat I am sitting on their patio? Uncommon objects — as the name suggests, this is a huge space containing all kinds of weird objects from creepy vintage dolls to china to stuffed animals. Allens Boots — you guessed it, that’s wear you buy your pair of cowboy boots! Mind you, it can poke a huge hole in your wallet. Big Top Candy Shop — an old-school candy store built to look like a combination between a pharmacy and a circus. And if that wasn’t cool enough, the shop features a soda fountain! 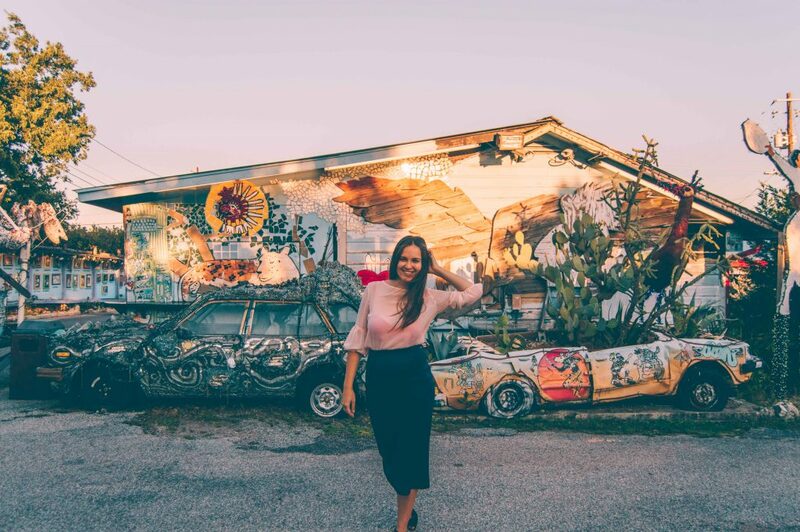 While you are in SoCo, make sure to take pictures with some of the most famous Austin’s murals. One of them is called “Greetings From Austin” and looks like a postcard. On most days, and especially on weekends, you’ll see a small crowd here, taking pictures and blocking traffic. 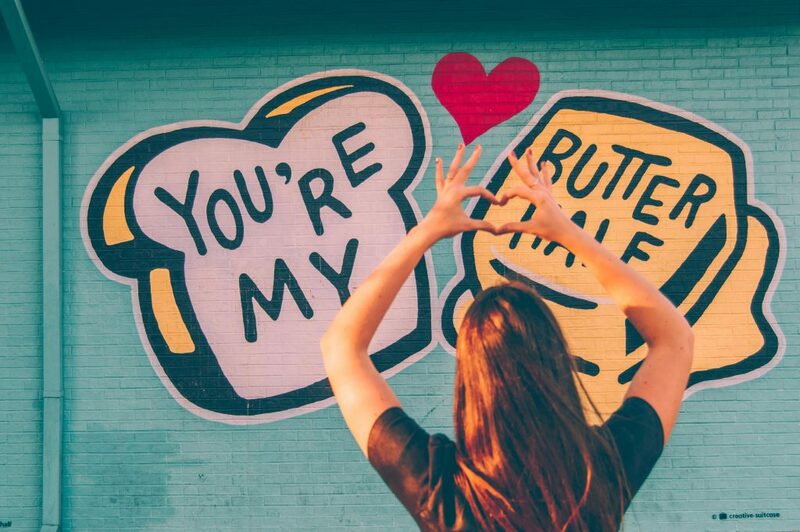 Another popular photo spot is the wall of Jo’s Coffee that features a graffiti “I love you so much!” There’s a beautiful story behind this sign. When the co-owner of Jo’s Coffee, Liz Lambert, had a fight with her girlfriend Amy Cook, the latter sprayed the words on the wall of the coffee shop. The sign eventually became one of the most recognizable symbols of the city. 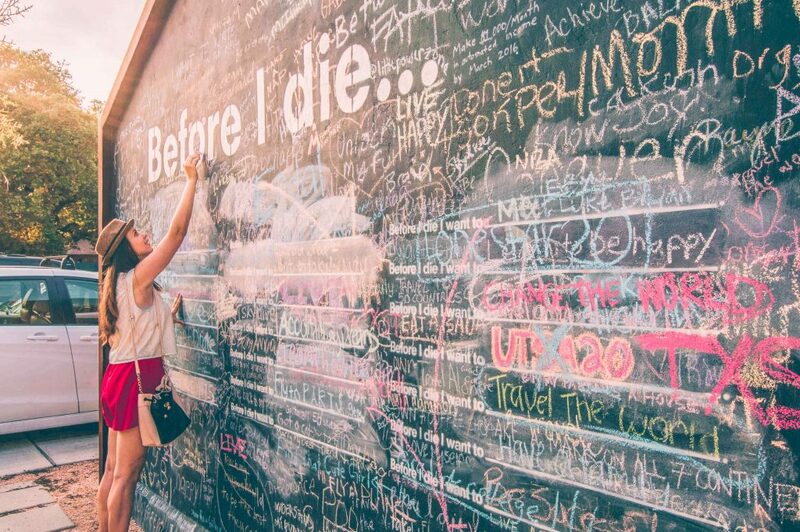 Write your resolutions on the “Before I die…” wall, only steps away from South Congress Avenue. While you are at it, stop by the “Before I Die…” wall and contribute to the many promises people write here. There’s usually chalk in a box by the wall to write your resolutions. We’ve covered some of the fun, now let’s get to weird! 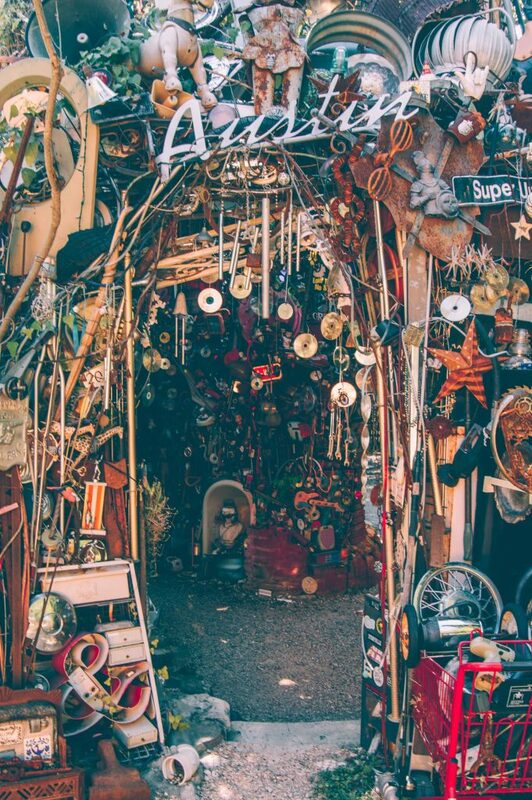 Cathedral of Junk is a multistoried structure made of discarded items and located in the backyard of a South Austin house. 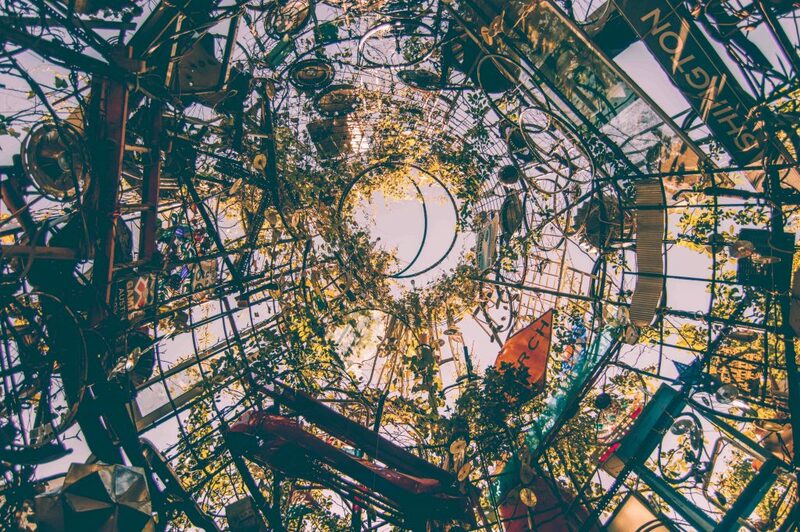 The construction of the cathedral started in 1989 by Vince Hannemann who used some 60 tons of junk, including bicycles, toys, and pieces of furniture for his project. 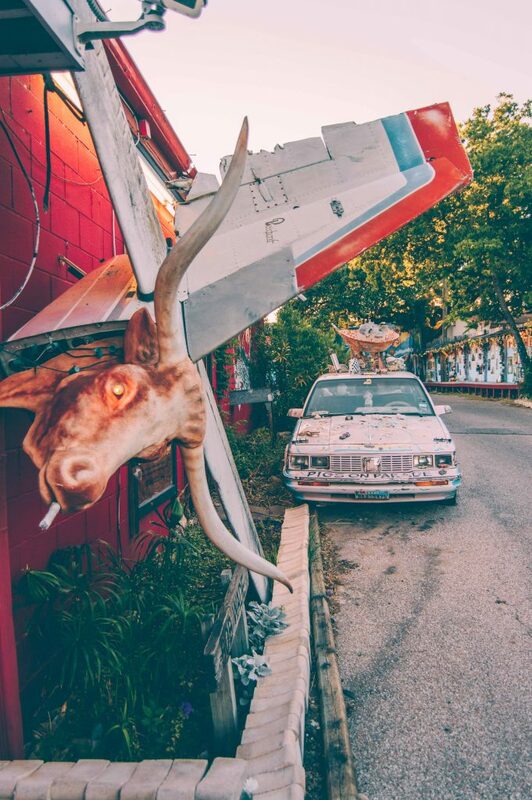 This is, hands down, one of the coolest and weirdest things to do in Austin. It requires some planing in advance since, essentially, you are visiting someone’s house. You need to call Vince ahead (512-299-7413) and make an appointment. 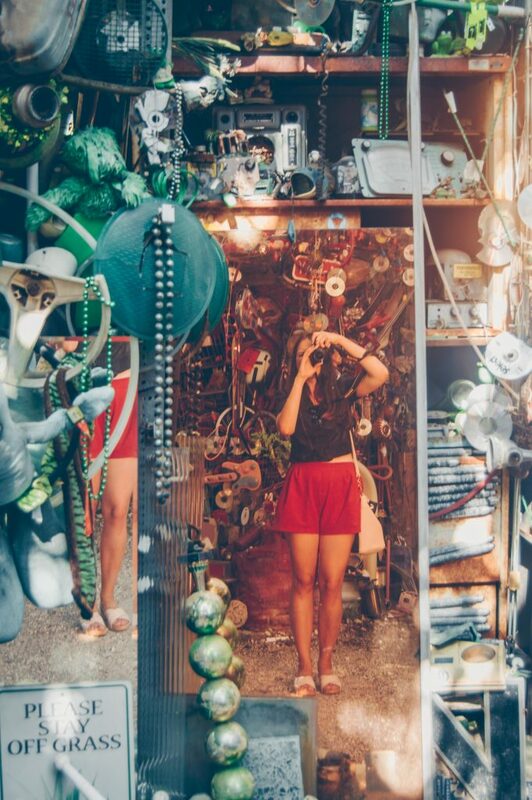 Once there, you pay $5 per person as a donation and can take your time exploring several stories of the cathedral with passages and rooms full of tires, mirrors and bottles built into cement. 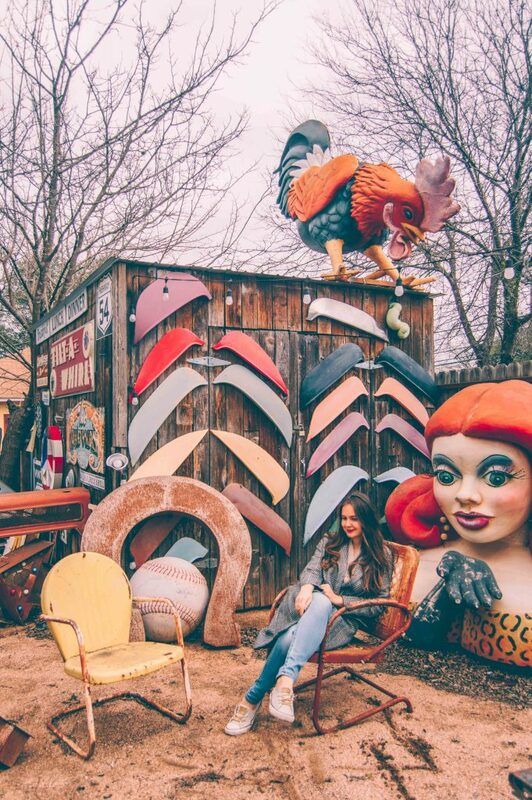 Cathedral of Junk — 4422 Lareina Drive (call Vince at 512-299-7413 to make a reservation). While LeRoy and Lewis is not your traditional Texas BBQ joint, this humble food truck in South Austin is what everyone’s talking about right now. Evan LeRoy, the pitmaster at LeRoy and Lewis (and formerly at Freedmen’s) chose an innovative approach to smoking meats. Instead of the familiar trio of brisket, ribs, and sausage, what you’ll find here is beef cheeks, quail stuffed with macaroni and cheese, and pork shoulder. The sides don’t fall far behind on the scale of creativity. Think: bbq fried rice, kimchi deviled eggs, and smoked ratatouille crostini. All the meats are sourced locally and LeRoy does some of the butchery himself to ensure the best quality. Valentina’s Tex-Mex — if you don’t mind driving further south, Valentina’s combines the best of two worlds by offering tacos stuffed with BBQ. 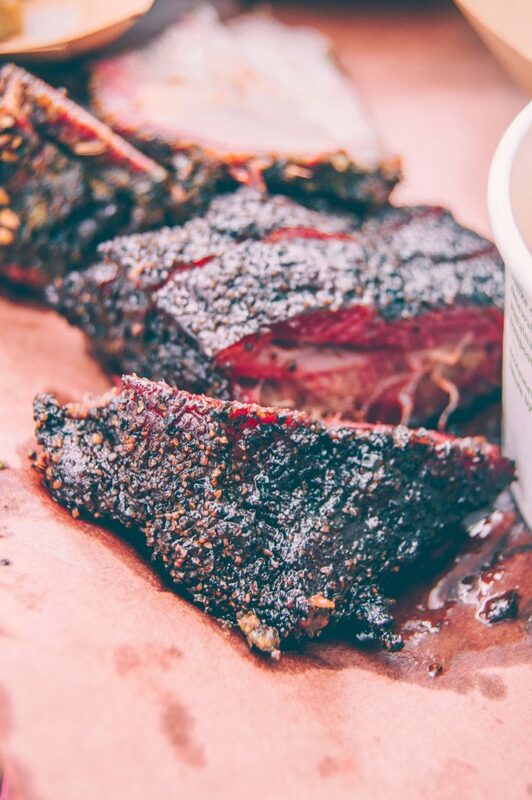 It’s on the Texas Monthly list of 50 best BBQ joints and rightfully so. Start with one taco; their tacos are incredibly huge and weigh at least half a pound each. Terry Black’s BBQ — another BBQ joint that made it to Texas Monthly list of 50 Best BBQ restaurants in the state. 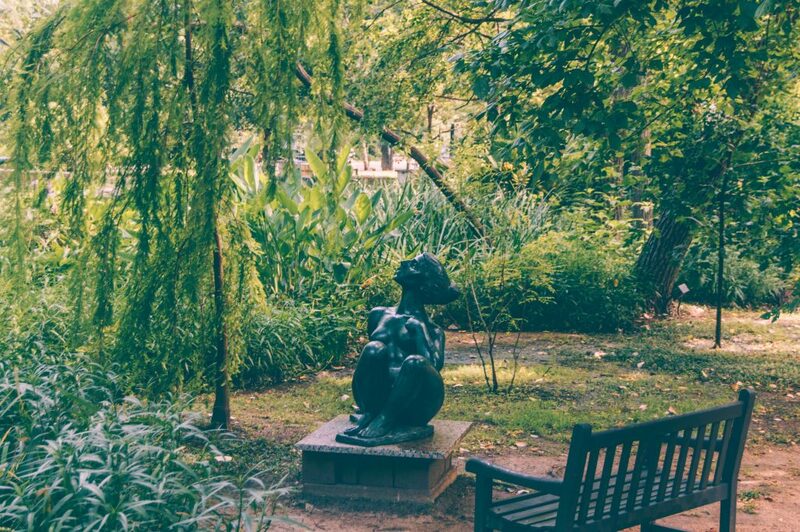 This one is located closer to the next stop on our guide — Umlauf Sculpture Garden. I promised to share with you some of my favorite lesser known gems of the city and Umlauf Sculpture Garden is one of them. It’s definitely not a tourist attraction, but rather a local’s favorite, especially when they have early morning yoga classes in the garden. 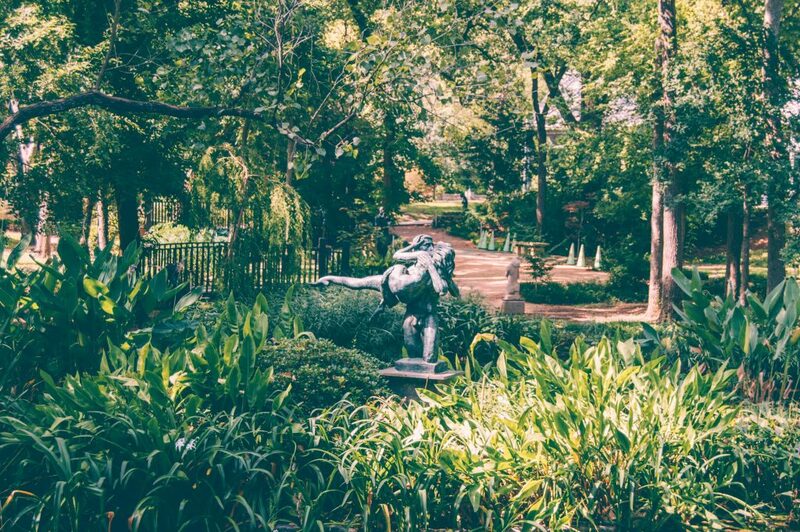 The outdoor garden is located near Zilker park and features the works of American sculptor Charles Umlauf. 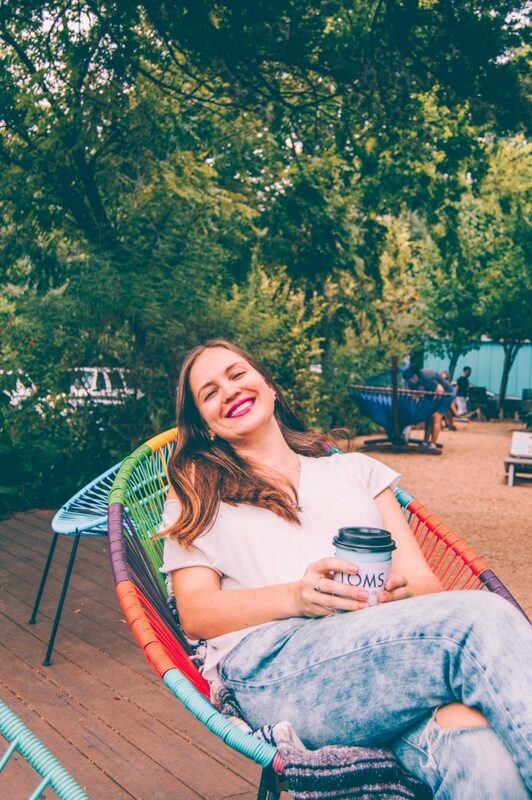 It’s one of my favorite spaces in the city: green, cozy, quiet and perfect for a little break during your eventful weekend in Austin. Swimming in a boat on Lady Bird Lake with my brother. Clearly I enjoy taking pictures more than rowing. A short ten-minute walk away from Umlauf sculpture garden is Austin’s favorite swimming spot — Barton Springs Pool. What makes this place so awesome is the fact that the pool is filled entirely with water from nearby natural springs. The water is fresh and cool all year round. During warm months the pool is one of the most popular hang-out spots in the city. Take your time to chill on the slopes and swim in the refreshing waters of the pool. Another great way to spend an afternoon outdoors is to rent a boat or kayak on Lady Bird Lake. 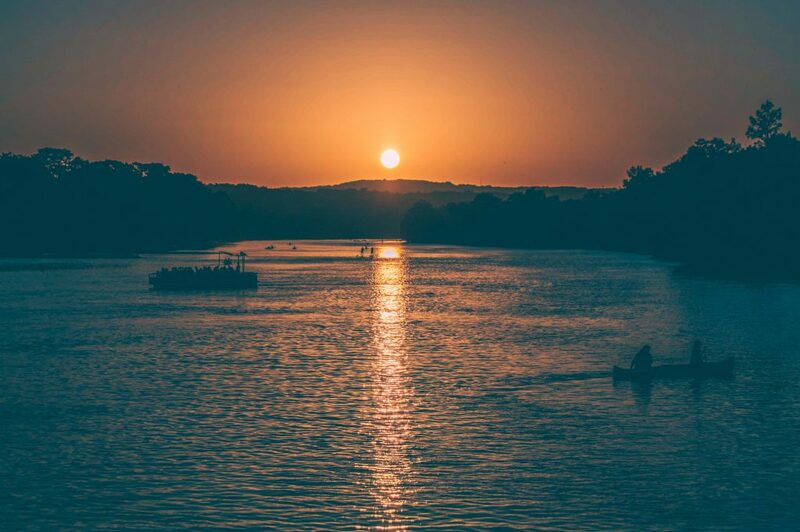 It’s a super popular activity among Austinites, and on weekends you’ll see hundreds of kayaks and paddle boards on the lake. There are a few companies renting equipment on the lake, for example, Rowing Dock. 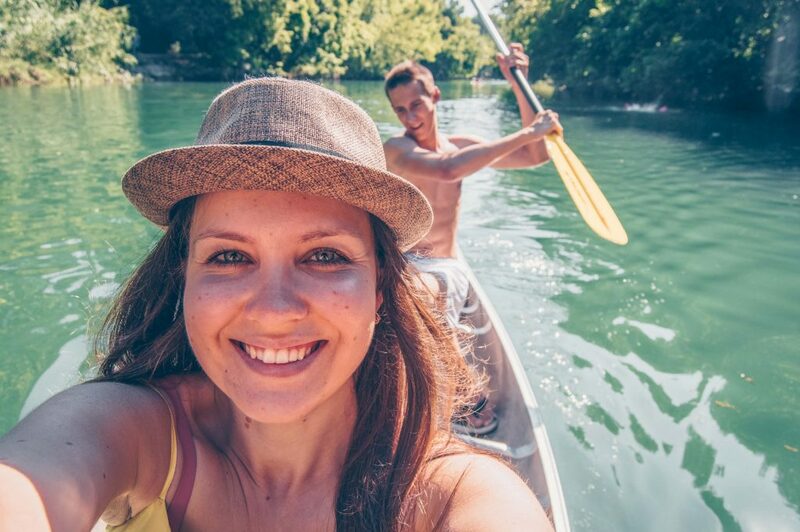 If you prefer a quiet afternoon to kayaking and swimming, explore one of Austin’s museums like Blanton Museum of Art or Bullock Texas State History Museum. You might have to skip Umlauf Sculpture Garden, though, since both museums close at 5 pm. 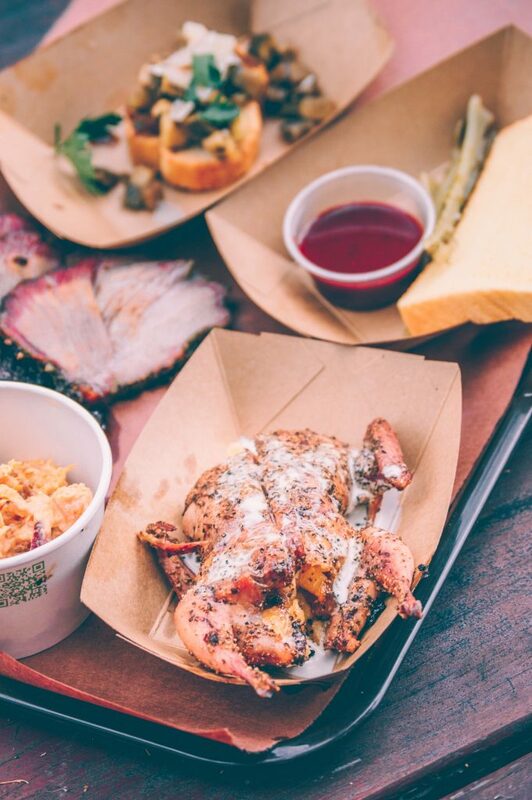 Now that we’ve covered our bases with tacos and BBQ, it’s time to explore other sides of Austin’s diverse dining scene. Easy Tiger is a bake shop and beer garden with an awesome menu featuring house-made breads, pretzels, sausages and craft beers. It’s a great spot for a casual al fresco dinner. Bonus: they have a ping pong table outside. Another advantage of Easy Tiger is it’s location at the intersection of I-35 and 6th St. which is where the Dirty Sixth starts. 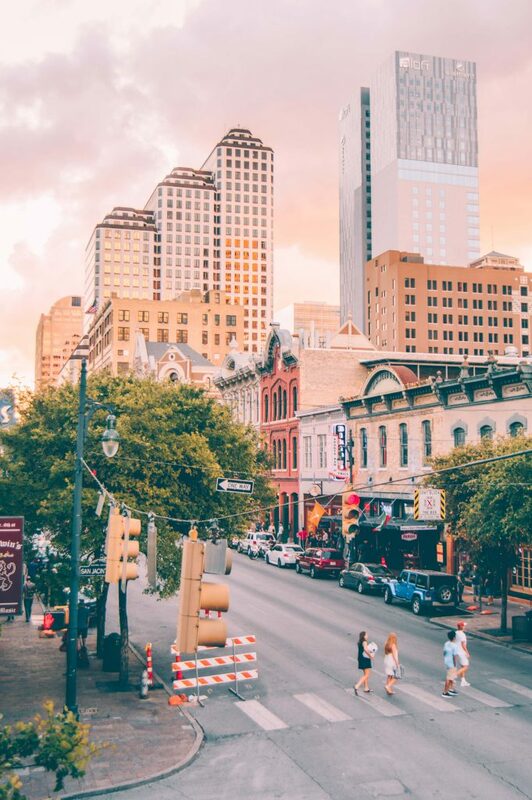 Dirty Sixth is how locals refer to the stretch of 6th Street with bars and live music where all the action happens at night. Italic — one of my favorite Italian restaurants in the city is also located on the 6th Street. They have thin-crusted pizza, house-made pasta, a laaaaarge selection of Italian wines and an espresso bar. 21.30 — Hit the Dirty Sixth! Still have energy after a day of shopping on SoCo, exploring weird architecture, and swimming at Barton Springs? Then it’s time to have some fun at the Dirty Sixth. Even if you are not in the mood for drinking and partying, walk this stretch of the 6th street just for the fun of it. It’s very crowded at night, what with all the blinking lights, cheap shots, and live music at every bar. Make sure to stop by the Driskill Hotel, the oldest operating hotel in Austin built in 1886. Walk inside and marvel at the beautiful interior design reflective of Texan traditions. One of my favorite bars on the 6th St. is Pete’s Dueling Piano Bar. 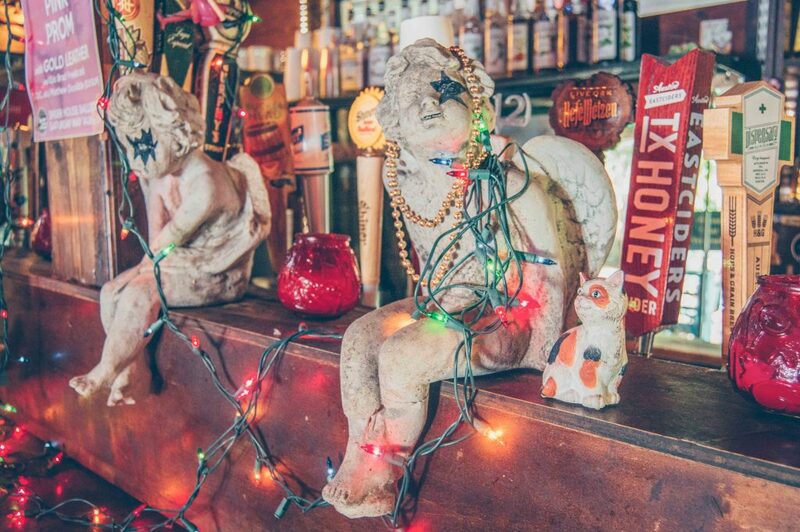 Other awesome places to stop by include Iron Cactus (Mexican food, margaritas and rooftop patio), Midnight Cowboy (a modern day speakeasy, make sure to make reservations), and The Parish (one of the best music venues in town). After you are done drinking check out Voodoo Doughnut on the 6th St. which is open 24 hours. Their overloaded doughnuts are a sure way to soak up the booze. I am personally not a big fan of such overindulgence, but it’s a favorite spot for many locals and tourists alike. Ok, maybe watching sunrise after hitting the Dirty Sixth last night is too much to ask of you, but at least get here early enough to see the beautiful view of the city and Lake Austin without crowds. 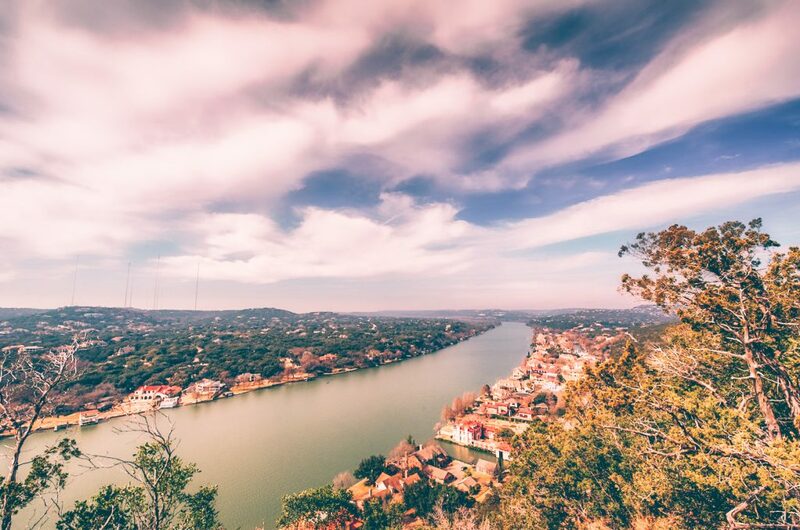 Although many reviews online call it a hike, the walk up Mount Bonnell is really short and easy. It won’t take you more than ten minutes to walk up and then it’s mostly walking on the plateau and enjoying the views. Trust me on this one, ok? You need more breakfast tacos in your life! You have only a weekend in Austin, so take advantage of the variety of awesome taco joints this city has to offer! Tyson’s Tacos was located within walking distance from my house in Austin’s Hyde Park and immediately became my favorite breakfast/lunch/late-night-dinner spot — tacos work for any occasion. Tyson’s, with its wooden structure, lack of windows, and glittery decorations, is one of those restaurants that make Austin the strange and awesome city it is. Besides, the menu at Tyson’s is fully created by its customers. The more tacos you buy, the more points you collect. Points can eventually be converted into your own taco on the menu. By the way, if you play ukulele, you can get a free taco by playing a song of your choice. No need to bring a ukulele with you — they have one hanging on the wall. True story. Austin vibes are really strong at Spider House Cafe! 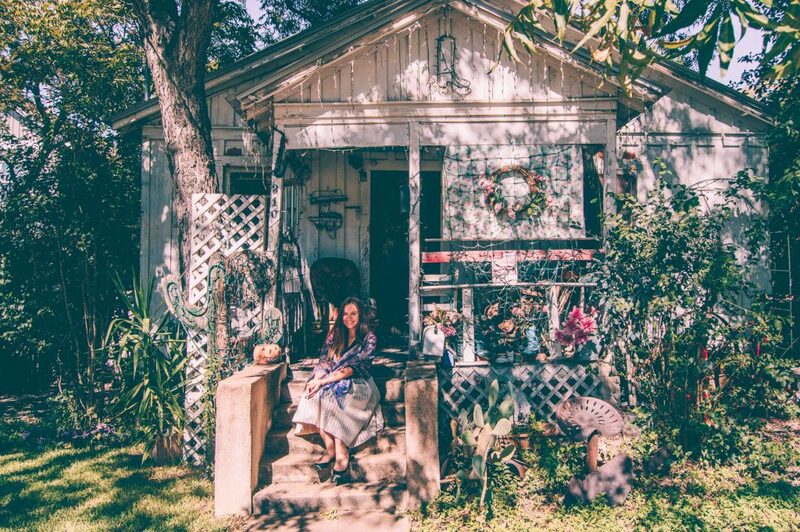 For a cup of coffee and some more of true Austin vibes, stop by Spider House Cafe the story of which spans back two decades. The cafe has a beautiful patio and garden with some unusual decorations like a bathtub with a sculpture of a boy peeing in it. Nothing special, we are in Austin after all. 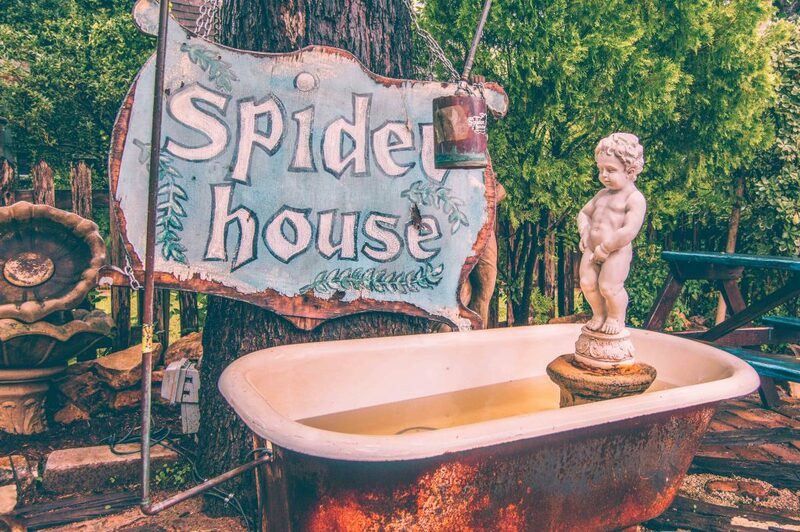 Around the corner from the cafe is Spider House Ballroom, a venue that hosts events seven nights a week, ranging from poetry readings to stand up comedy to live music. 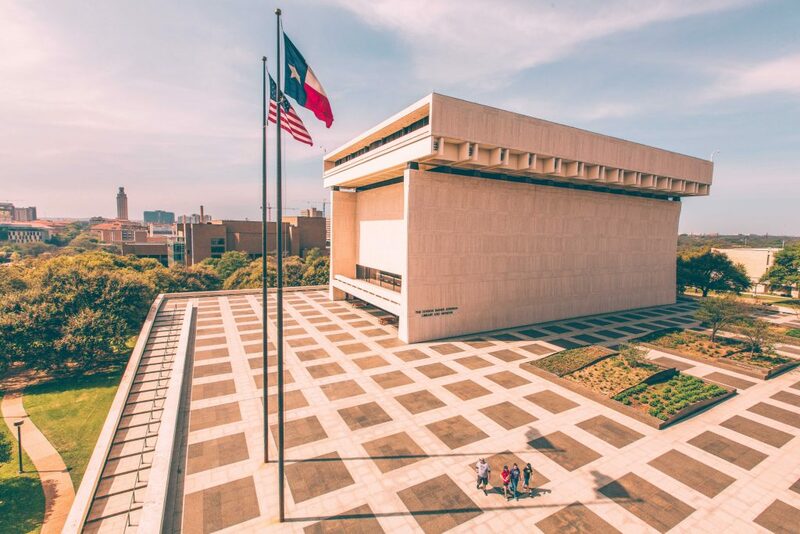 Lyndon Baines Johnson Presidential Library in Austin is really more of a museum than library dedicated to the 36th president of the United States. Lyndon Johnson was born and raised in Texas. In fact, even during his time in the office he spent a lot of time at his ranch in Stonewall which is why it was often called the Texas White House. At the library, you can learn about his life, family and the years serving as the president. The collection includes over 54 000 objects donated by the President, his family and friends, including the clothing worn by LBJ and his wife, Lady Bird Johnson, at the inauguration, some furniture from the Oval Office, and the desk used for the signing of the 1965 Voting Rights Act. A walk around the museum can easily take two to three hours. Just like LeRoy and Lewis I suggested for lunch on day one of our weekend in Austin is not a traditional Texan BBQ joint, so 24 Diner is not your regular American diner. The restaurant’s essence is best described by its creators: “We took all the elements of the concept we liked — classic American cuisine, good service, fun atmosphere — and turned it up about 10 notches”. Think: a diner that features a chef-inspired menu, local and organic ingredients, and a vast beer and wine list! Plus! It’s open 24 hours. Located across the road from 24 Diner is Whole Foods flagship store. Believe it or not, it is the most photographed place in Austin, TX! Not the statue of Stevie Ray Vaughan, not the Dirty Sixth, not the State Capitol Building, but a supermarket! 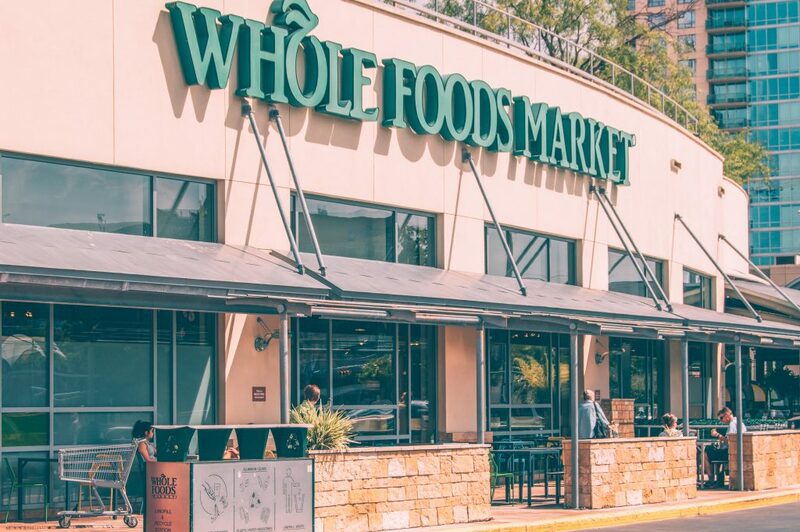 Austin is where Whole Foods takes its roots, so no wonder their flagship store on North Lamar Blvd is nothing short of amazing. First of all, Whole Foods being Whole Foods, it has all kinds of locally produced natural and organic products. But that’s just the top of the iceberg. Inside the supermarket, you’ll find a coffee shop, a juice station, a taco stand and a BBQ joint. They even have a bar where you can have a glass of wine if you are too tired of doing groceries. In summer, they offer yoga classes on the rooftop, while in winter the rooftop is turned into an ice skating rink. 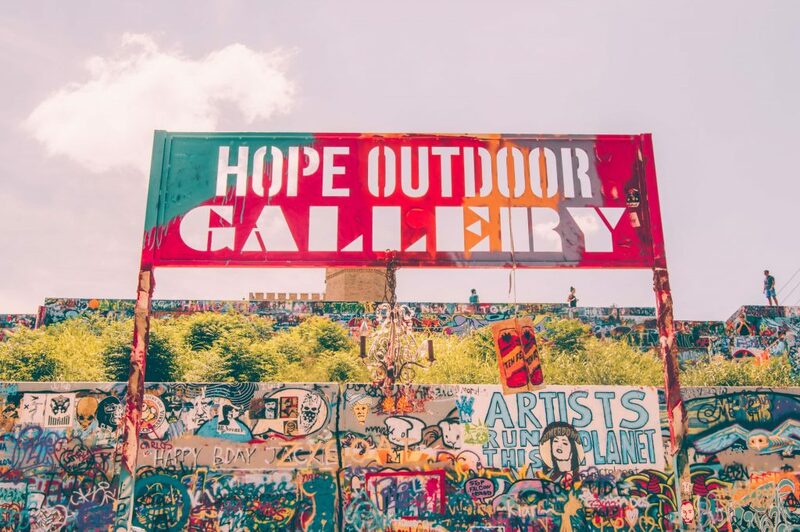 Only ten minutes walk away from the Whole Foods store is Hope Outdoor Gallery, a beautiful outdoor park providing space for murals and graffiti. It’s one of the beloved gems of the city which, unfortunately, is about to be closed down and relocated. 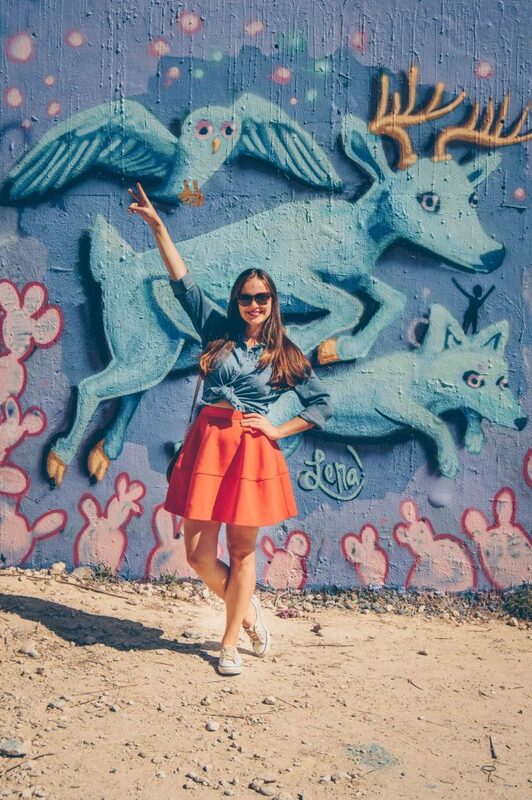 The space is essentially walls erected on a slope that serve as canvas for local artists. 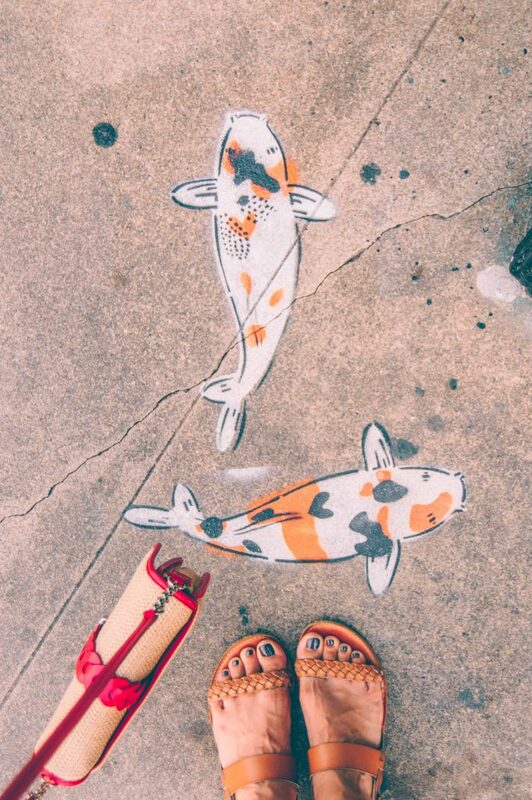 As the murals are painted over one another, every time you come here, you are bound to see something new. Climb up the slope to the top of the gallery and you’ll be rewarded with a gorgeous view of Austin. 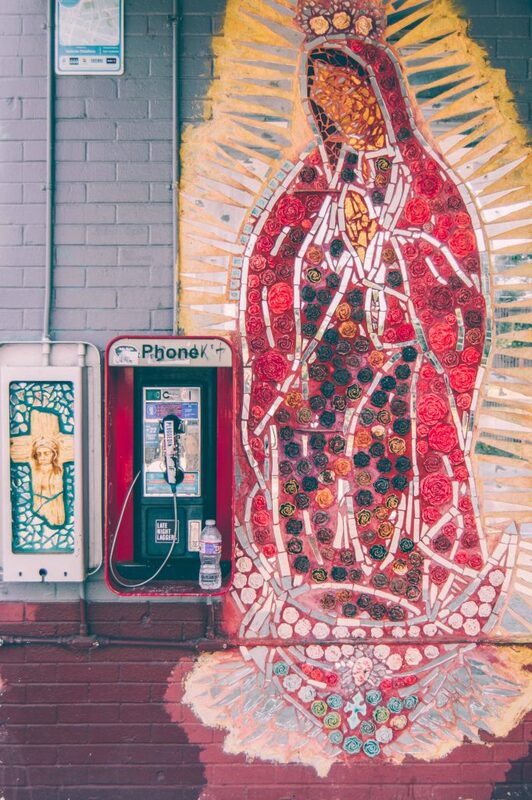 Tip: these might be the last months of Hope Outdoor Gallery on Baylor Street, so don’t miss a chance to visit it. The new gallery is under construction now and will be located at Carson Creek. Everything is bigger in Texas, even State Capitol. At 92 meters, it is one of the tallest in the country and even taller than the United States Capitol in Washington, D.C. The building is open for visitors until 10 pm on weekdays and till 8 pm on weekends. But if you want to take a guided tour (they are fun and free of charge) you have to come before 4.30 pm (3.30 on weekends). Guided tours leave from inside the South Foyer every 30 to 45 minutes and last about half an hour. 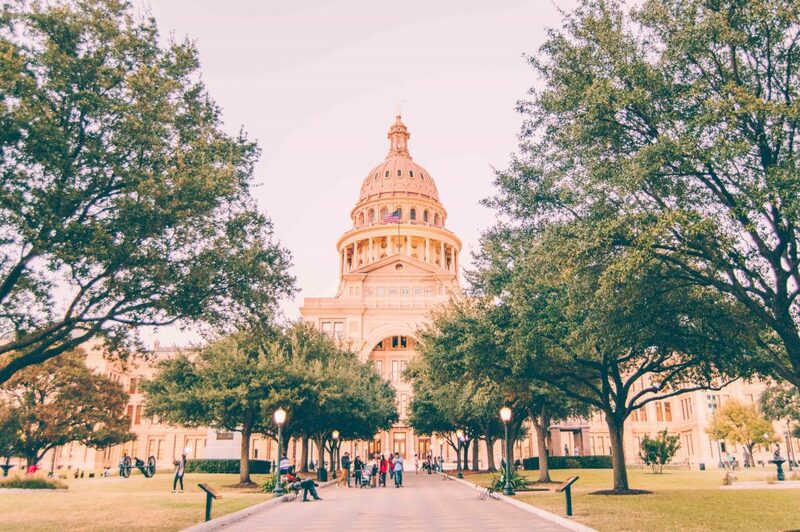 Tip: If you want to do a guided tour you’ll need to come to the Texas State Capitol first (right after lunch) and then circle back to Whole Foods and Hope Outdoor Gallery. 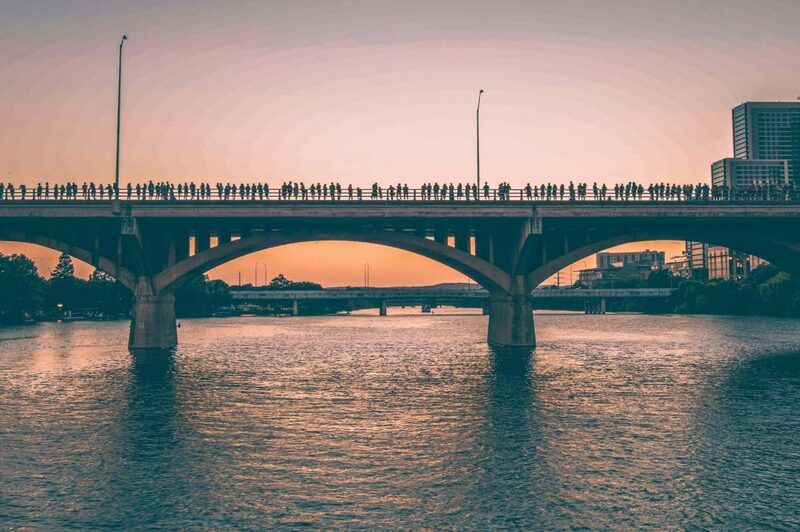 People gathered on Congress bridge waiting for the bats. If you are visiting Austin from March to October, watching the bats fly from under the Congress Avenue Bridge is a must. By the end of summer there’s as many as 1.5 million Mexican free-tailed bats living in the crevices of the bridge. Every night they emerge at sunset and fly out eastward. People start gathering on the walkway on the east side of Congress Bridge about an hour before sunset. The hillside below the bridge (on the south end of the bridge) is also a good viewing spot. But in my experience, the most convenient and sure-fire way of watching the bats is by taking a riverboat cruise. Since the bats are living under the bridge, the best vantage point is from the water. Even if you don’t get a good view of the bats, the sunsets in Austin never fail to impress! The thing is sometimes watching the bats is a real spectacle and sometimes it’s just ok. Depends on the month and, even more so, on your luck. On some nights you can see the colony fly out at once and it seems like a large black scarf is stretching through the sky, other times they emerge in smaller groups and fly low, hidden behind the trees. If the latter happens, you’ll be able to see some action from the boat and pretty much nothing at all if you are standing on the bridge. Ramen so perfect you’ll come back to Austin just for a slurp of this rich pork bone broth. Ramen Tatsu-Ya is one of the most critically acclaimed restaurants in the city with a never-ending line of hungry ramen-lovers waiting to get a table. The line moves pretty fast though. The restaurant was opened by Tatsu Aikawa and Takuya Matsumoto. In a surprising twist of events, both of the chefs are also DJs. 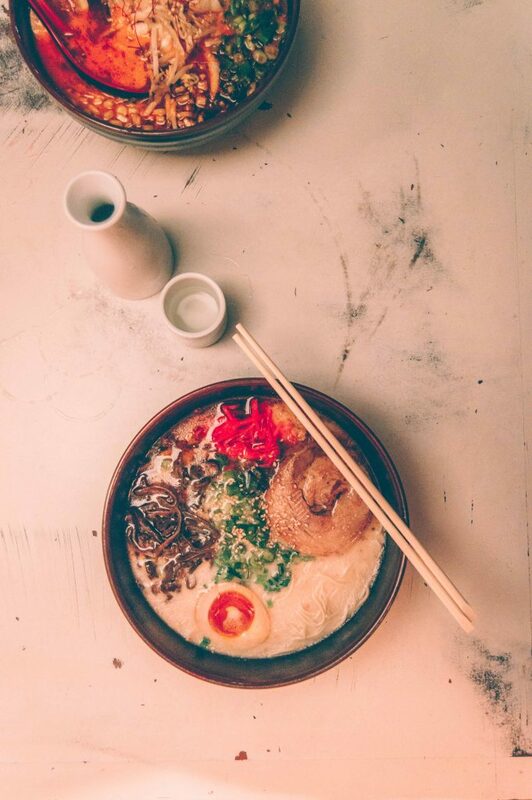 Tatsu Aikawa, who formerly worked at two Michelin star restaurant Urasawa in Los Angeles, missed good ramen in his home town of Austin which was the initial reason behind teaming up with Matsumoto and creating Ramen Tatsu-Ya. Uchi — another superstar on the dining scene of Austin, but in comparison with Ramen Tatsu-Ya which is more informal and casual, Uchi provides a fine-dining experience. Award-wining Chef Tyson Cole offers his signature, non-traditional take on Japanese cuisine with focus on ingredients. Seafood is flown every day from Fukuoka and Tsukiji markets in Japan. 22.00 — Live Music Concert One Last Time? If you still have the energy — come on! you are only in Austin for two days! — hit one more live music venue before heading home. 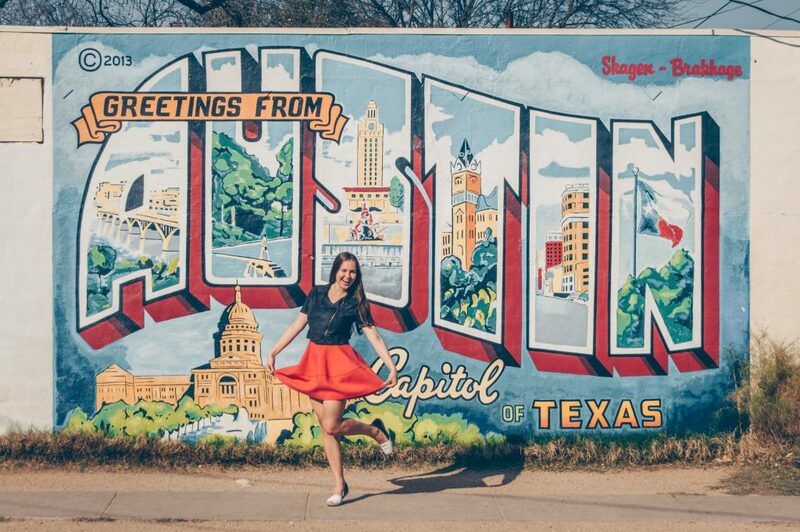 Austin is the live music capital of the world, after all (even if self-proclaimed). 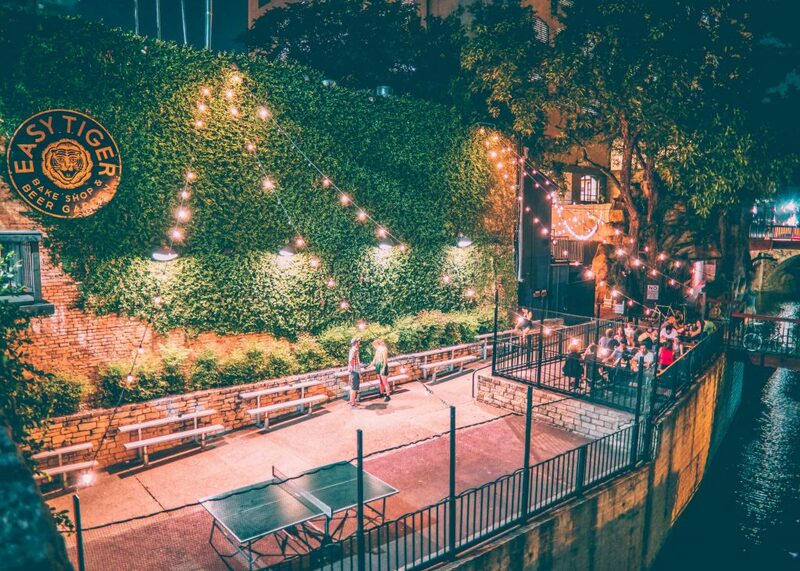 Some of the best venues include The Continental Club, Antone’s and Elephant Room. And here your weekend in Austin is coming to an end. 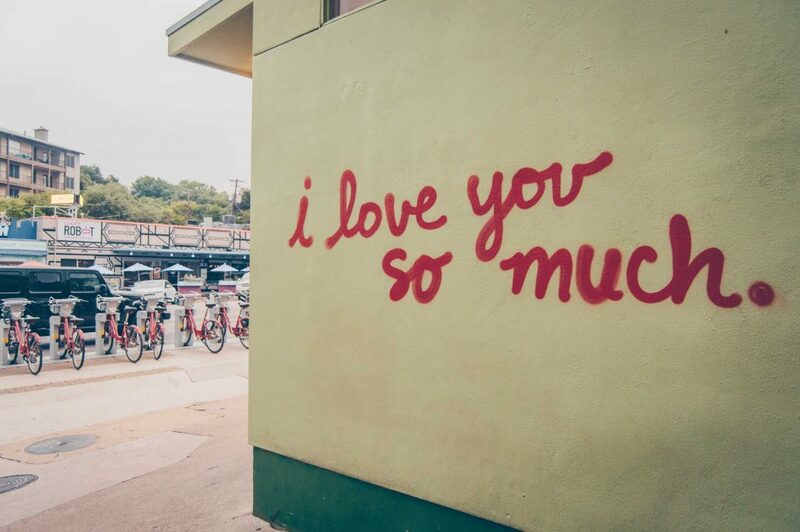 I believe with this 36-hour guide to Austin you can scratch a lot of must-do items off your list. We had breakfast tacos and Texas BBQ, watched the bats, took a picture in front of Whole Foods, listened to live music, and saw a thing or two that keep Austin weird! 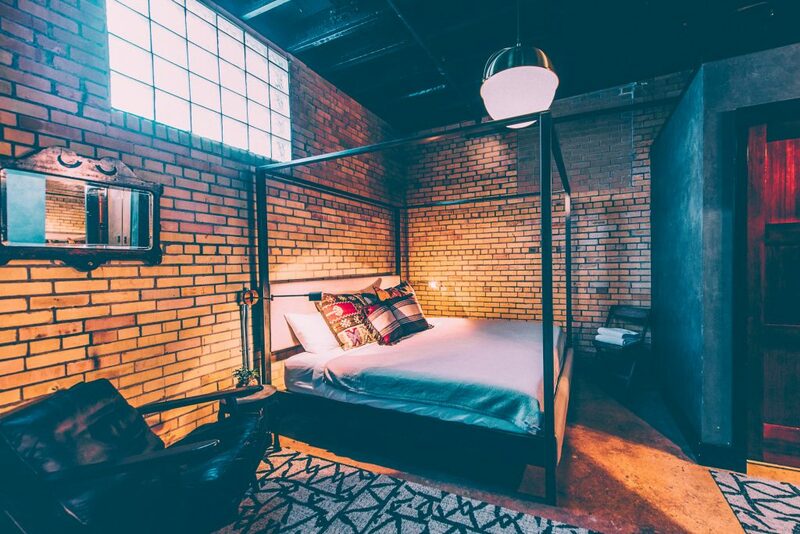 Where to Stay During Your Weekend in Austin? 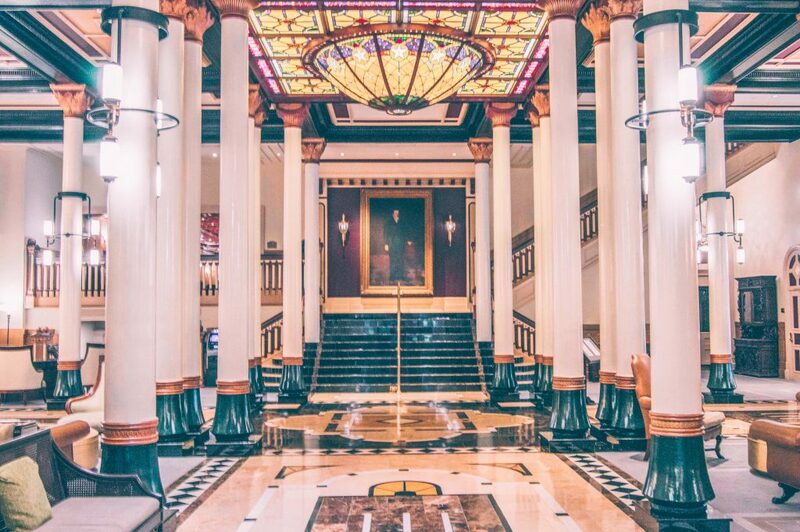 The Driskill Hotel lobby features marble floors and stained glass dome. If you have come to Austin to experience true Texan vibe, the Driskill is the place to stay. 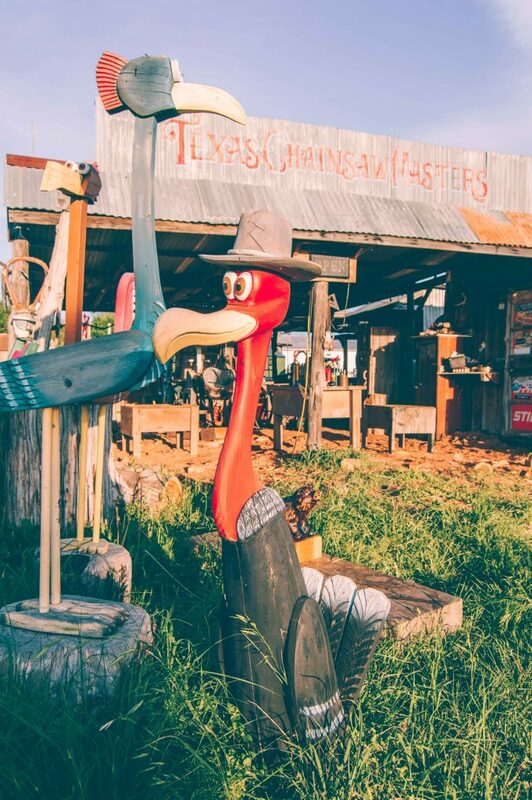 Here, luxury meets Texan traditions. On the one hand, you see grand lobby with marble floors, columns, and stained-glass dome. On the other, there are couches made of cow skin and statues of cowboys throwing lasso at the Texan Driskill Bar. Whether you book a room here or not, stop by for a cup of coffee with French pastries at the 1886 bakery on the ground floor. 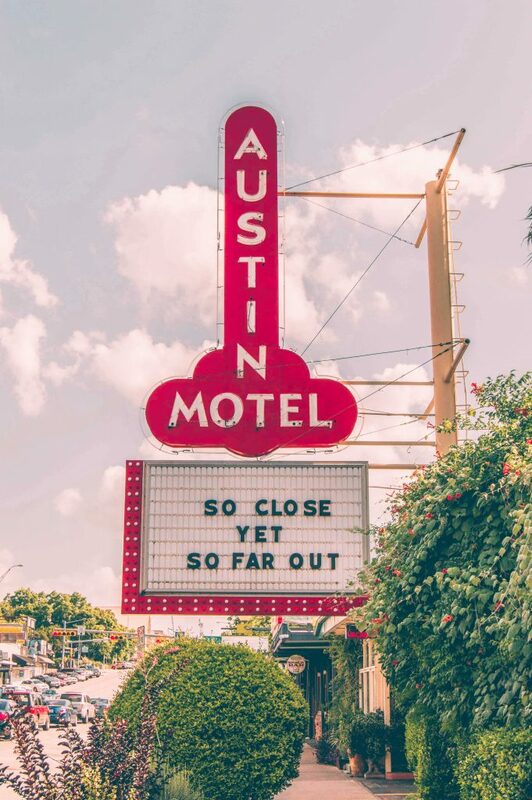 Austin Motel street sign is one of the most recognizable icons of the city and the South Congress avenue, where it’s located. If you want to stay at one of the most popular and bustling neighborhoods of Austin, this is your place. 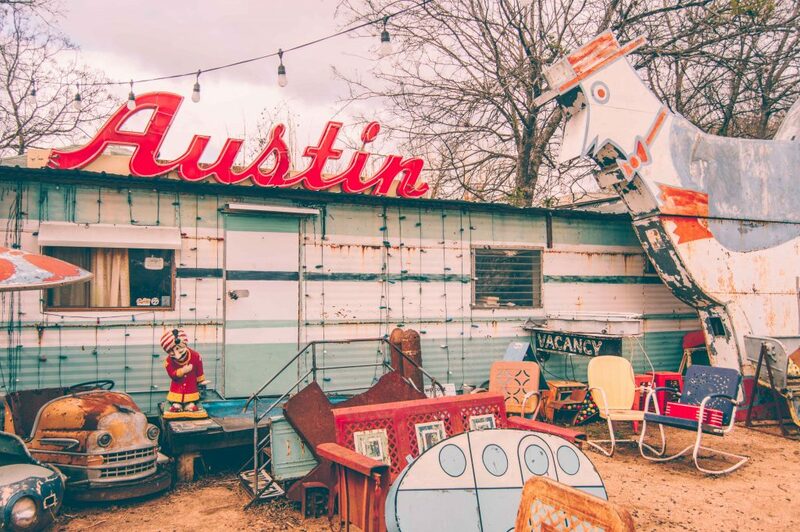 Austin Motel is right in the middle of Austin’s nightlife, shopping and dinning. The South Congress bridge where you can watch the bats at night and the iconic “Greetings from Austin” mural are walking distance from the motel. The accommodation in Austin is far from being affordable, so it’s especially nice to come across a place like Native Hostel. It might be called a hostel, but the interior design is nothing less than chic and stylish. The hostel features 4-bed and 6-bed dormitory-style rooms that have oversized single beds with privacy curtains, as well as two king suites with a private bath that can be shared by two people. 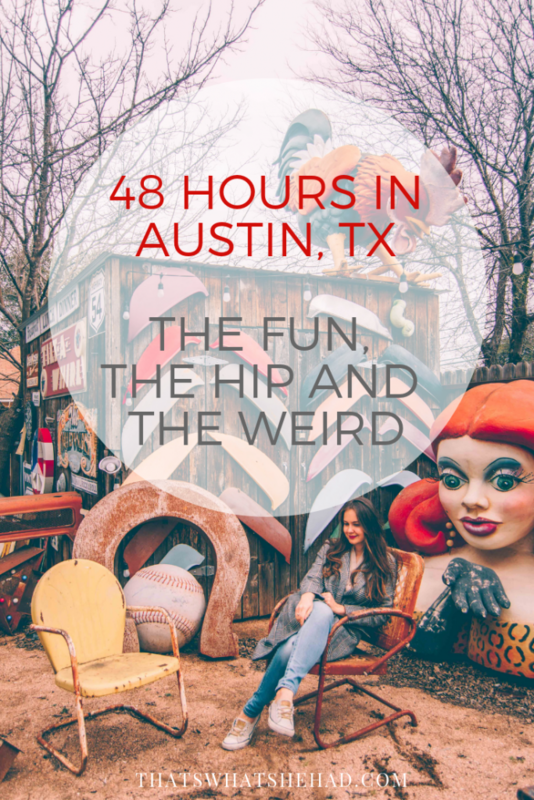 What Else to Do in Austin if You Have Three Days? If you have three days in Austin, consider a day-trip to Hamilton Pool, Krause Springs, Jacob’s Well or Lyndon Johnson ranch in Stonewall. 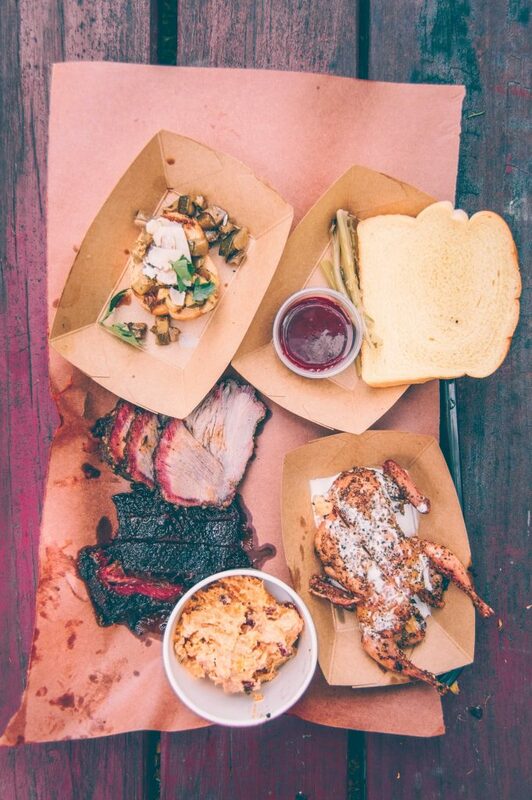 If you travel for food, then you cannot miss trying Franklin BBQ! You’ll have to wake up at 6 am and stay in line for 4 hours, but this spot beloved by Barack Obama and Anthony Bourdain is totally worth it. Check out how I stayed in line for Franklin’s famous BBQ here. 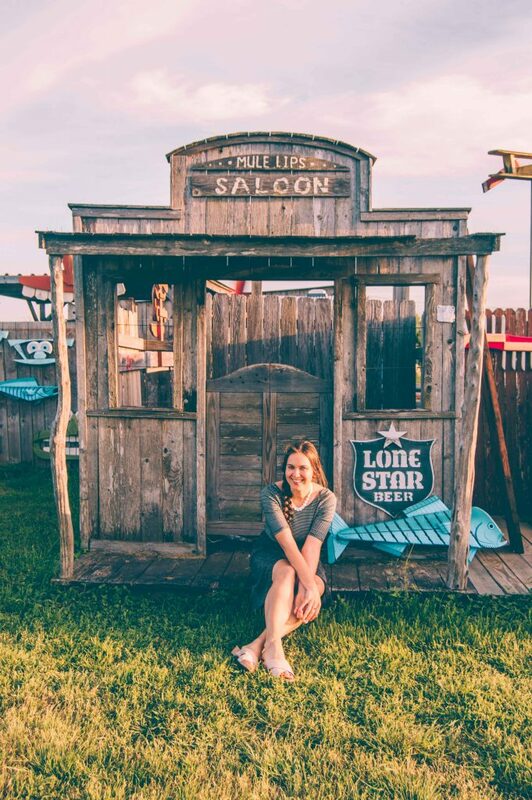 To learn how to dance traditional Texan two-step, hit Broken Spoke! If this Russian chick learned how to dance two-step, so can you! 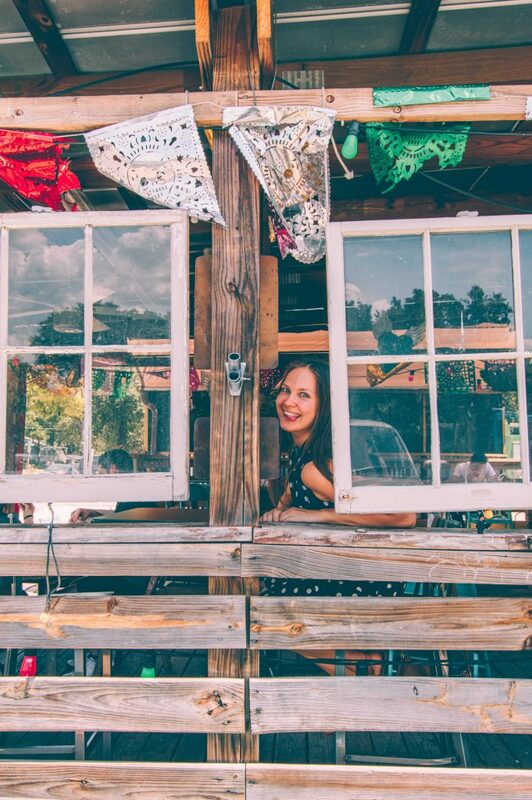 If you are a fan of good coffee, check out my guide to the best coffee shops in Austin. If you want to explore more of Texas, check this post with 30 of my favorite Texas photos that will inspire your travels! 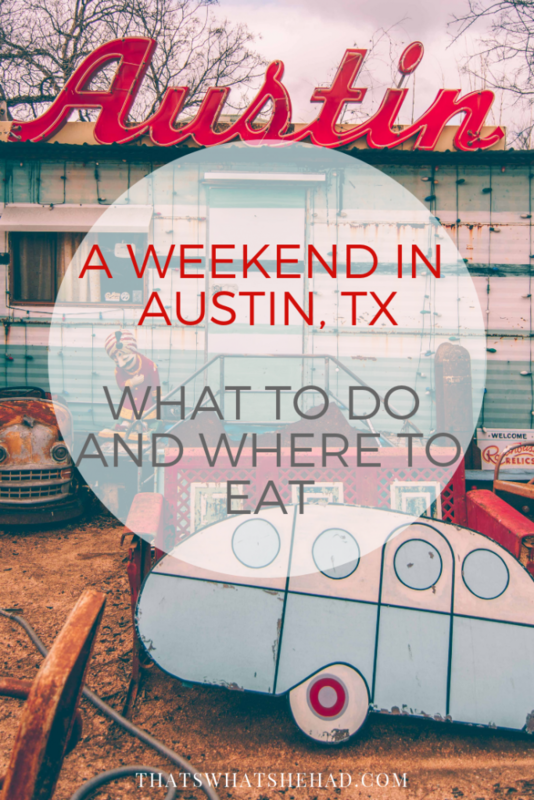 Have something to add to this weekend guide to Austin? Let me know in comments! And definitely let me know if you followed it and had a good time in my beloved city! This…is a fantastic guide. Thank you for putting it together! Will use on my first trip to Austin, which I’m determined to make this year. Yay! I hope you enjoy Austin and have a taco for me (or five). I miss it very much!